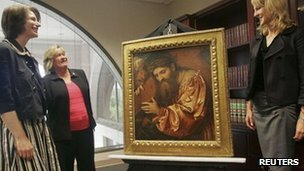 A 474-year-old painting stolen by Nazis during World War II has been returned to the heirs of its Paris-based Italian Jewish owner. Christ Carrying the Cross Dragged By A Rascal by Girolamo de Romani was one of 70 items stolen from the collection of Frederico Gentili di Giuseppe. US officials confiscated the work in November as a 15-year effort to return the painting came to a head. Gentili died of natural causes in 1940, a month before the invasion of France. His collection was sold by the Vichy French government in 1941. "Thanks to the tireless efforts of those involved, we are now righting a wrong perpetrated more than 70 years ago," Susan McCormick, a special agent with US Homeland Security investigations told reporters. "Seventy years is a very long time. But it shows that it is never too late to right a wrong." The painting was one of 50 works on loan to a museum in Tallahassee, Florida from the Pinacoteca di Brera Museum in Milan, Italy. The Italian museum had purchased the work in 1998. An employee at Christie's auction house tipped off Interpol investigators last June that the painting may have been stolen. Gentili's grandchildren filed a suit in 1997 to get his art collection back. A few years later, the Louvre Museum in Paris returned five paintings belonging to the collector to his family. The paintings are among the estimated hundreds of thousands of works stolen from Jewish families by the Nazis. Homeland Security officials have repatriated almost 2,500 works to 23 countries since 2007. Gentili's grandchildren plan to sell the work. "For a cake, it is relatively easy cutting it into six, not totally easy but quite easily," Lionel Salem, one of the heirs, told the Reuters news agency. "But for a painting, you see, it is more difficult."